How does God use you? 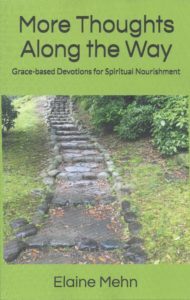 Last month, Elaine published her second book, More Thoughts Along the Way: Grace-based Devotionals for Spiritual Nourishment. This follows up her first book Thoughts Along the Way published in 2002. Elaine’s writing has been a blessing to many people, especially in the area of spiritual renewal. We are so delighted to have this book now available. But we have more writing projects planned and summer is a good time to get a jump on them. Elaine’s 2002 devotional book has been out in hardcopy all these years, but we hope to have it available in eBook format by the end of August. The Japanese version of Thoughts Along the Way is nearly completed and we hope to see that in paperback and eBook versions very soon. Elaine also wrote a bilingual Bible study on spiritual growth which we will publish in English and in Japanese. John’s book, Multiplying Churches in Japanese Soil came out last fall. The Japanese version of that book should be completed this year and ready to discuss with a Japanese publisher. He is working on another book about the religious beliefs in Japan and how to better present the gospel to the Japanese. He hopes to have that ready and published sometime in 2019. Another book on Japanese leadership will follow that work. Please be in prayer for us as we continue these many writing projects. We want God to be glorified as we help people in their spiritual lives and ministry.